Preferred Habitat: These fish are normally found in estuarine and marine habitats throughout the Atlantic coast southward to areas near Charleston, S.C. In recent years, they have become abundant in inland reservoirs. Common Size: 6-9 inches, less than 1 pound, most landlocked specimens less than 1/3 pound. Maximum Size 19 inches, weight up to 4 3/4 pounds. 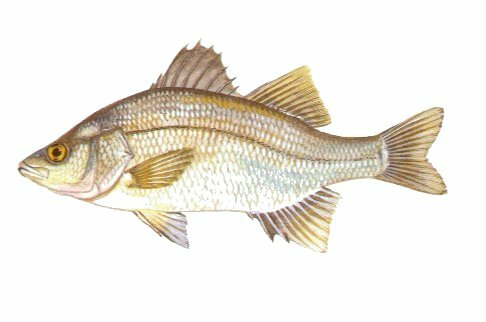 Food Habits: White perch prefer a diet of small fish, insects and other invertebrates. Spawning: From April to June when water temperatures average 50  60 °F. The white perch migrate into tributary streams where females release up to 300,000 adhesive eggs. Immediately following the laying of the eggs, males release millions of sperm cells. In spite of this haphazard spawning ritual, the ratio of hatched eggs is enormous when compared to other fish. Eggs can hatch in as little as 30 hours or take as long as six days depending on water temperature. White perch can mature and spawn at a size of 5 inches. Miscellaneous: In its natural range along the coast, the white perch is a popular species. However, when unintentionally established in inland reservoirs, it has proven to be more of a pest than a benefit. Its high reproductive capability allows it to out compete more desirable game species. It also has a slow growth rate, which makes catching enough keeper sized fish difficult. Despite these negative aspects, the white perch has tasty white flaky flesh. It is also an aggressive biter that has salvaged many an otherwise fishless fishing trip. White perch are also very spiny and it is impossible to handle a lively specimen without getting pricked.